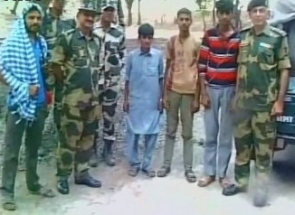 Amid the tense ties between India and Pakistan, a heart-warming gesture was witnessed when three Pakistani minor boys, who were apprehended after accidentally crossing over to the Indian side in Ajnala town in Amritsar district, Punjab were handed back on Saturday, laden with gifts and sweets, by the Border Security Force. Aamir, 15, Nomin Ali, 14, and Arshad, 12, were on their way to meet their relative on a motorcycle, when they crossed over to India on Friday and were caught by the guards on patrol duty. Aamir, who hails from Faisalabad and studies in IX standard, said that he was deeply touched by the way he, his cousin and friend were treated by the BSF soldiers. "The soldiers, who caught us for crossing over, fed us well and took care of us. I want my government to treat Indians the same way we were taken care of," he said. As soon as the boys were caught, the BSF contacted the Pakistani officials, telling them about the minors and also informed the Indian authorities and were instructed to hand the boys over straight away. "We had a meeting with their wing commander and handed the boys over. They were children and clearly did not have any untoward intention. We gave them gifts and since it was Ramzan, they hadn't eaten all day, so we gave them some chocolates as well. We wanted them to take back good memories of India," Commander Meena said. The BEST celeb book? VOTE!